VICTORIA – The University of Victoria celebrated Vikes student-athletes both current and former at the annual Celebration of Champions event on Apr. 5 at the Victoria Conference Centre. Among the Vikes varsity major awards, the night highlighted the inductions of three prestigious Vikes alumni into the UVic Sports Hall of Fame. Fourth-year captain and men's rugby player Gradyn Bowd took top honours as he was named the President's Cup winner and awarded the trophy from UVic President and Vice-Chancellor Jamie Cassels himself. U SPORTS gold medal and record-breaking swimmers Eric Hedlin and Danielle Hanus were named Athletes of the Year, while U SPORTS Community Service Award winner and women's swimmer Taylor Snowden-Richardson was highlighted as the Chancellor's Award winner as an outstanding contributor. U SPORTS women's field hockey Rookie of the Year and national champions Anne-Sophie Hannes was named Female Rookie of the Year, while men's rugby eight-man Nicholas Carson was Male Rookie of the Year. Among those also recognized Wednesday evening were UVic Sports Hall of Fame inductees Lori Clarke, a Vikettes women's basketball standout (1984-87) that graduated UVic as a Nan Copp Player of the Year, two-time national champion and three-time CIAU All-Canadian and Canada West All-Star. Women's field hockey midfielder Sara Ballantyne Brant spent five years with the Vikettes (1982-87) and was a part of the inaugural 1984 National Championship team, while also named a CIAU All-Canadian three times. Vikes men's rugby alumni Michael Holmes was inductes as a builder for his leadership in philanthropy. Holmes started one of the first Athletic scholarships and has co-founded numerous awards, programs and foundations to support the growth of Vikes rugby and young rugby players in Canada. For more read here. The President's Cup is given annually to the outstanding student-athlete in fourth or fifth year who best combines scholastic achievement and athletic ability. Gradyn Bowd has been a dominant player for the Vikes men's rugby player for the past four seasons. Also a finalist for Vikes Male Athlete of the Year, Bowd's academic excellence also put him in as a finalist for the President's Cup. The Education major has led by example throughout his time as a Vike, working with the younger players on the squad and setting the tone for the importance of coaching the next generation. As the varsity team's captain, Bowd sets up the training schedules for the varsity players and is balancing his training and team commitments while on his final teaching practicum. In the men's premier league, the fourth year has been a constant threat. On Jan. 26 Bowd totaled four tries and nine converts for 38 points scored, a feat not done by a Vike in over 30 years. Heading in to the final games of the season Bowd totalled 190 of the Vikes' 430 points. Bowd has made several sacrifices over the past few seasons, putting off national team program calls to concentrate on the Vikes and his education degree. Bowd has also volunteered for a number of community club teams in Victoria as a head or assistant coach and he has spent a number of summers in his home province of Alberta working with high school and provincial age-grade players. Bowd is a catalyst to make sure the Vikes also gets out to other events and has undoubtedly been a leader by example for his team. The other nominees for the President's Cup were five-year Vikes rowing standout Daan Arscott, and two-time cross country All-Canadian Alison Irvine. Read more. Third-year Vikes swimmer Danielle Hanus continues to be a threat in the pool year after year. 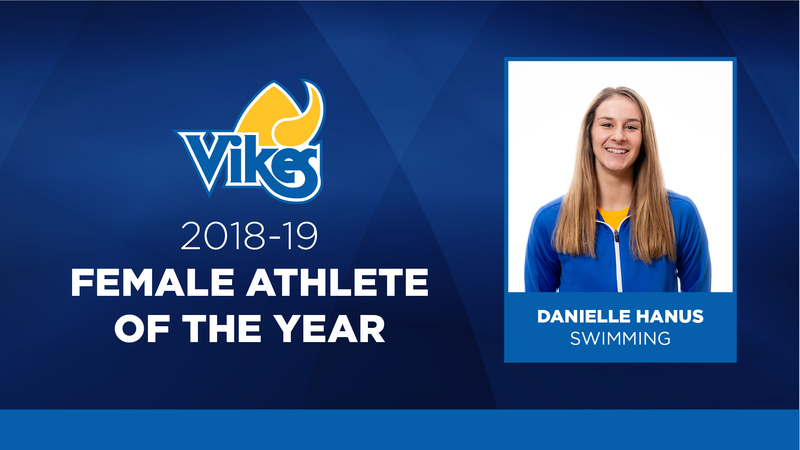 A finalist for the Vikes Female Athlete of the Year award last year as well, Hanus returned to the pool to once again medal in all of her individual events at the conference and national level. Hanus was named a Canada West First Team All-Star after winning gold in the 50-m backstroke and the 100- and 200-m butterfly. She earned a Canada West silver in the 100-m backstroke and set Canada West records in her 200- and 100-m butterfly swims. At the U SPORTS Championship Hanus won gold in the 200-m butterfly and finished with two silvers in the 50- and 100-m backstroke and a bronze in the 100-m butterfly. Hanus helped set five Vikes school records including the 100-m and 200-m freestyle as part of the relay team and then the relay teams themselves in the 4x100-m freestyle, 4x100-m medley and 4x200-m freestyle events. Hanus was also Varsity Council Athlete of the Month in February for her performance at the U SPORTS National Championship. The other finalists for Female Athlete of the Year were Canada West women's basketball Second Team All-Star and Vikes leading scorer Amira Giannattasio and U SPORTS women's field hockey Athlete of the Year Anna Mollenhauer. Read More. 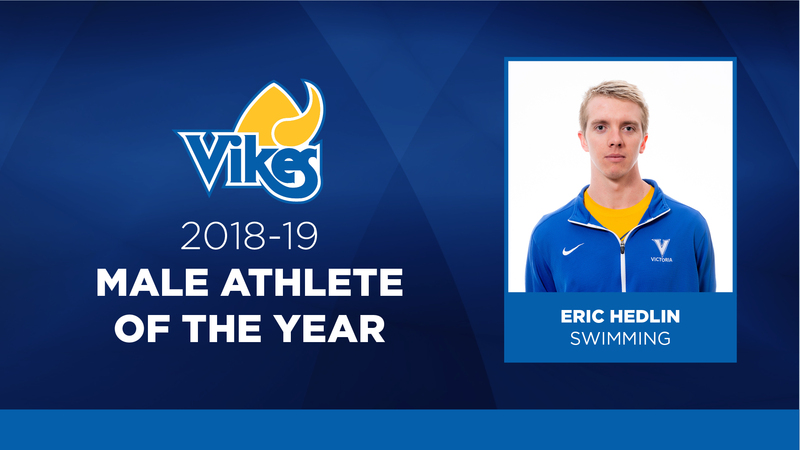 Fourth-year Vikes swimmer Eric Hedlin closed out his season as a U SPORTS First Team All-Canadian and gold medalist after the open water specialist topped the podium in the 1500-m freestyle for the second time in his UVic career. Hedlin also set a U SPORTS national record for his race time of 15:34.16. Less than a week before competing in the U SPORTS championship Hedlin returned from an international open water competition with travel and fatigue that was a likely factor in his performance. Despite his open water commitments, Hedlin returned to the pool to compete for the Vikes and his three points from his gold-medal win helped secure UVic the points they needed to finish fifth overall at the national championship. At the conference level, Hedlin was named a Canada West First Team All-star after winning gold in both the 1500-m freestyle and 400-m freestyle, while he also helped the Vikes' 4x200-m freestyle relay team earn bronze. Internationally, Hedlin had a break out swim at the 2018 Pan Pacific Championships earning a silver medal in the open water event, while he also posted Canada's best result on the men's side of the competition. Hedlin was Varsity council Athlete of the Month in February and Swimming Canada and Swim BC's Open Water Swimmer of the Year in 2018. Men's rugby captain Gradyn Bowd and men's rowing national medalist Luc Brodeur were named finalists for Male Athlete of the Year. Read more. The Chancellor's Award is presented to a student-athlete, who is an outstanding contributor to his or her team, both in and out of the competition venue. They provide leadership and vision exemplifying the goals of the team. 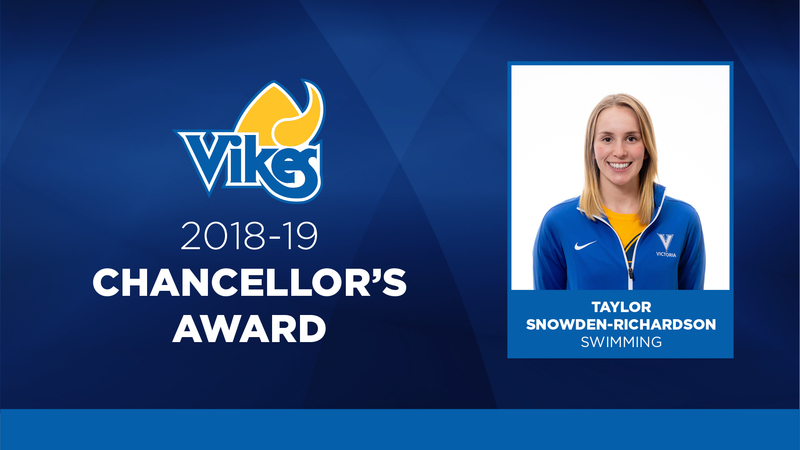 As one of just two fifth years on the Vikes women's swimming team, Taylor Snowden-Richardson has been a natural leader throughout her time at UVic. She leads by example on a daily basis rarely missing workouts or events for the team, constantly working to improve her swimming, working with recruits or new athletes on the team, while she consistently maintains one of the best academic standings on the team. This season Snowden-Richardson was recognized as the U SPORTS and Canada West Student-Athlete Community Service Award winner. Snowden-Richardson has won the conference honour the past three seasons. A consistent student on the Faculty of Science's Dean's List and the Vikes Honour Roll, Snowden-Richardson was also awarded the Jamie Cassels Undergraduate Research Award in the department of Medical Sciences. Beyond her commitments at UVic, Snowden-Richardson worked to create a project known as Tay's Team that started in 2017. The biology and psychology major personally knits and crochets fun recognizable character hats such as Disney or Pixar princesses for children staying in hospitals. Tay's team has donated 173 hats to hospitals throughout B.C. and in Calgary and San Diego. In addition, Snowden-Richardson has organized the Vikes swimming team to run an annual food drive for the Victoria Mustard Seed, while in 2018 she also started volunteering weekly at the UVic Brain and Concussion Research Lab. Her volunteering also extends to the UVic research project on psychosocial adjustment in the siblings of young homicide victims and she also gives her time at the Nanaimo Regional General Hospital in the summer. Rounding out the finalists for Chancellor's Award for Vikes men's basketball stand out Jordan Charles and men's soccer's Isaac Koch. Read more. First-year Victoria midfielder Anne-Sophie Hannes was a key addition to the Vikes lineup in 2018 that went on to win both the Canada West conference and U SPORTS national banners. An exchange student from Germany, a country well-known for its success in international hockey and competitive club structure, Hannes' international experience was evident right from her first game. Despite not getting on the scoreboard, Hannes was a regular starter in all 10 games this season and showed her versatility both on the outside and in central midfield. Hannes' technical skills were superior, often maintaining possession or trapping difficult passes under incredible pressure, while her ability to turn on attack at speed made her an unpredictable part of the Vikes offence. Defensively, Hannes was the loudest player on the field despite English being her second language. The rookie was honoured as both the Canada West Rookie of the Year and the U SPORTS Rookie of the Year after the team finished first in the conference regular standings on goal differential with a 6-2-3 record. The Vikes beat York in Toronto in their first two games of the best-of-three U SPORTS championship to hoist the McCrae Cup for the first time since 2008. The other finalists for Female Rookie of the Year include cross country and track runner Caitlin Mann and women's rowing Brown Cup champion Danae McCulloch. Read more. Few first years can say that they are a staple on Doug Tate's varsity men's starting rugby roster but Victoria's Nicholas Carson started every game this season as number 8, one of the most technical and challenging positions. Heading in to the end of March, Carson was one of the team's leading scorers with 12 tries as the end of the BC Premier League season draws nearer. In his grade 12 year Carson was selected to the Under 19 and Under 20 national teams but the academically gifted student-athlete chose at this time to focus on Vikes rugby and his degree in the Gustavson School of Business. In November the Vikes hosted the Canadian University Rugby Championships where Carson helped his side earn a bronze medal. Following the tournament, Carson was named to the Tournament XV. Head coach Tate highlights Carson for his maturity, ability to lead by example, intensity in practice and his strength and athleticism on the field. The other finalists for Male Rookie of the Year were Canada West All-Rookie team member from men's basketball Aaron Tesfagiorgis and U SPORTS All-Rookie team member and men's soccer's leading scorer Matteo Ventura. The Vikes celebrated 85 Vikes Honour Roll Recipients, who all achieved 80 per cent or higher in the 2017-18 academic year. Third-year forward and men's field hockey player Chris Lee had the highest GPA of that group boasting a flawless 9.0 GPA in the Faculty of Sciences. Lee was honoured at the Vikes Honour Roll Luncheon in November and again at the Celebration of Champions event. Last season, Lee balanced a heavy class schedule with regular training and weekly travels to Vancouver for games, while also being a regular volunteer at Vikes events and with varsity council. Read more. The Times Colonist Publisher's Award for Community Contributors is awarded to those individuals within the community who have made an outstanding volunteer contribution to a varsity program. For over a decade, the Camosun Bachelor of Athletic & Exercise Therapy program has supported the Vikes by offering placement opportunities for their students with our varsity teams. Camosun Athletic Therapy students have provided invaluable services to Vikes teams through their work attending practices and competitions, providing athletic therapy skills and first aid services, supporting concussion and injury assessment procedures, liaising with the Vikes Sports Medicine team and varsity team staff, and becoming part of our Vikes teams. This program has facilitated the placement and training of these students, working closely with the Vikes head Athletic Therapist, Traci Vander Byl.